Bear In Heaven are back, and with a new joint record release deal with Hometapes (their former label) and Dead Oceans! In this post: a stream of their latest single, “The Reflection Of You,” and a link to their site where you can listen to “Noon Moon,” played not at its normal speed, but at a duration that stretches it into infinity and turns a normal single into a drone track. (They have quite the artistic statement about it; read below.) Dead Oceans and Hometapes will partner to co-release I Love You It’s Cool on April 3, 2012. At some point these two ideas merged into one. We would stream our album earlier and for longer than anyone else had before but we’d stream it once. We’d stretch it far beyond the limits of being recognisable as pop music. Draw it out so that snare roll lasts for days. Invite listeners to interpret & consider each sound. sit back and breathe. And lastly, a video interview with Bear In Heaven, on how much they love Hometapes (perhaps an explanation for why the album is co-released with Dead Oceans, rather than on Dead Oceans alone)! Most people assume that when a band makes it—that is, reaches a critical mass of listeners, where shows across the country get packed, where the big festivals come calling, where placement on year-end lists seems preemptively settled—the work stops. It’s as if all the hours spent writing and rehearsing, tacking flyers to utility poles or maintaining forever-multiplying social media platforms suddenly switch off as some vaunted rock-star lifestyle switches on. And in some cases, maybe it does; then again, Bear in Heaven’s never been about easy expectations of normalcy. After the release of their second album, 2010’s Beast Rest Forth Mouth, big things began to happen for the Brooklyn trio of Jon Philpot, Joe Stickney and Adam Wills, from the aforementioned accolades to an electrifying collection of remixes featuring some of electronic music’s heaviest hitters, like The Field and Studio. As if in a transatlantic dream, they even split a single with Norway’s Lindstrøm and Christabelle, who covered their calling card, “Lovesick Teenagers.” But Bear in Heaven didn’t settle for the new well of notoriety they’d opened. Rather, they played some 200 shows in support of Beast Rest Forth Mouth—touring the world, playing progressively bigger rooms, building an intricate stage show that turned an album of songs into a synesthetic experience. When it was over, they retrenched in Brooklyn and, during the dead of summer, retreated to a chilly practice space to work harder than they’d ever worked on any other project. They wrote, re-wrote, arranged, re-arranged, spending days or weeks building one song at a time. 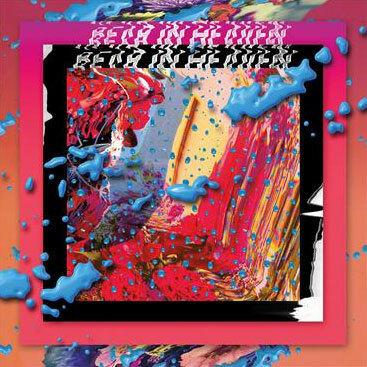 After months of testing their limits and trusting their instincts, Bear in Heaven emerged with I Love You It’s Cool, an album so vivid and visionary that it meets and even exceeds the confidence and calm its title suggests. For years, Bear in Heaven existed as a nights-and-weekends band, the sort of project that was more of a casual hobby than a career path for a few Southern natives who’d been living in the city for years. As such, they associated more with New York’s experimental vanguards, whether playing at the late, great Tonic or touring as a backbone for composer Rhys Chatham. But in 2010, Beast Rest Forth Mouth delighted listeners with the unexpected—futuristic rock music that didn’t sound alien or bound to ostracize. Taking these songs from coast to coast and continent to continent, they learned that having fun with this music was copacetic, that they could delight a crowd while defying musical binaries. I Love You It’s Cool turns that realization into a peerless set of instant anthems. Indeed, some of these songs are ready for the floor. On “Sinful Nature,” a perfect, tiny guitar theme spirals through colossal drums and slabs of synthesizers, suggesting perpetual motion. “Cool Light” booms with bliss, icy keyboards reflecting off of a relentless throb. It’s inescapable. But the intricacy and edge of Bear in Heaven’s music is not only here but sharper and more sophisticated than ever before. Philpot’s programming is both complex and compelling, whether in the refracted rainbows he warps on “Kiss Me Crazy” or the noisy matrix he weaves across “Space Remains.” Certainly, “The Reflection of You” feels like a hit, with a hook that instantly catches and a bridge that curls its finger—lyrically, stylistically, temptingly—toward the dance floor. Philpot’s mix of nostalgia and need is immediately relatable, too, bringing the band’s exploratory sounds a little closer back to home. But the song exits in a moment space-rock ascendance, a readymade rock-club banger that erupts into a bold new direction. I Love You It’s Cool is the first time Bear in Heaven has sounded so unapologetic and so evolved, so risky and so redeeming, so focused and so finessed. After years of restless exploration, this feels like a definitive arrival. I Love You It’s Cool is music written in the present tense but ready to speak to the future. The work is its own rarified reward. David Wrench engineered and mixed I Love You It’s Cool during two months at New York’s DNA. Roberto Lange, Rhys Chatham, James Elliott and Agathe Max contributed to the sounds. Dead Oceans and Hometapes will partner to co-release I Love You It’s Cool on April 3, 2012.